Why are forests burning in Russia before the beginning of the fire risk season? Russia's forest fire season has come early this year and already claimed human lives. In Khakassia debris clearance has begun and decisions are being made on compensating victims; meanwhile much of the southern part of Siberia is still burning. Experts say that reason for the blazes is habitual burning off of dry grass, exacerbated by windy weather. Russian President Vladimir Putin has flown in to help decide on compensation for those affected. On Sunday April 12 Khakassia, a Russian federal republic around 2,100 miles east of Moscow, went up in flames. Squalls fanned a number of small fires, creating a conflagration that swiftly spread to some 40 settlements, killing 30 people. More than 600 required medical attention and almost 5,000 people were left homeless. An emergency situation has been declared for the region. Seven other regions have found themselves in a similar situation. Small fires are being extinguished all over the country, from south western Siberia's Kuzbass region to the Moscow suburbs. According to official data, forest fires already extend over more than 100,000 hectares. Gregory Kuskin, head of Greenpeace Russia's fire prevention project, says the figures probably underestimate the true situation as fires in open areas are categorized not as fires but as inflamed heaths and are not included in the general statistics. "The burned settlements in Khakassia and Zabakail are not the results of forest fires but of those that take place in the open territories," explains Kuskin. "They are not registered as fires and this is why it is difficult to estimate the dimension of the disaster. A similar situation can occur in [the Far East's] Khabarovsk Territory, where local officials have said that they are starting the large-scale burning of grass, as well as in the European parts of Russia." According to Tatyana Yevtereva, a 58-year-old pensioner who lives in the Volga region, dry grass is burned every year. "What else is there to do with it?" she says. "The most important thing is to look after the fire. Here in the steppe there are strong winds, which is why sometimes people's sheds burn down. However, so far no one has seen his house burning." One of the main theories why the fires are spreading so uncontrollably is that fires lit to burn grass are not carefully tended or protected from strong winds. Kuskin says that climate change is exacerbating forest and heath fires throughout the world. "This year Russia has had a difficult spring: There was little snow and it melted early," he notes. "Most of the fires in Russia occur because of the burning of grass. People burn grass in their gardens and on farmland in order to clear the ground." However, this is not the only reason for the catastrophe. Even though they know there will be such blazes, local governments seem incapable of controlling the fire, says the Greenpeace expert: "The regions are underfinanced as far as issues of forest protection are concerned. The money for these objectives is allocated from the federal budget and is then managed by the region. This year, due to the crisis, less money is available." The regions are also trying to demonstrate that they are carrying out their function, which is why they do not recognize the fires early enough, do not announce emergency situations and underestimate the size of the blazes when filing official reports. Kuskin is convinced that a law introducing penalties for burning grass is needed. "The president has issued a decree and a bill had been prepared on this but it has not yet been accepted. Now it is being considered by the State Duma once again." It will not be possible to completely avoid the fires, but something needs to be done. Kuskin believes that the police should oversee the lighting of fires. "It is also necessary to make sure the regional governments do not distort the statistics,” he says. “As well as to introduce sanctions for governors who know about the situation but do not do anything. Now all the attention will be directed towards providing the fire victims with homes, while the officials who did nothing to prevent the tragedy will receive gratitude." Some are being held to account: At least 25 criminal cases have been opened in connection with the fires and bureaucratic negligence. Even the head of Siberia's Zabaikal State Forest Service has been detained. The Federal Forestry Agency is checking safety procedures and readiness for fighting forest fires throughout the country. 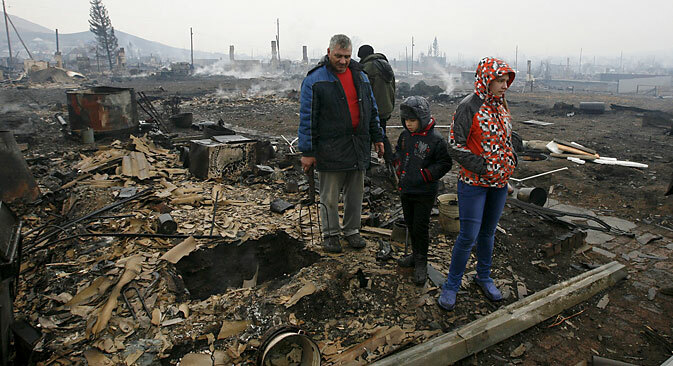 Russian President Vladimir Putin, who arrived in the Republic of Khakassia on April 21, remarked that the government has set aside 680 million rubles ($12.7 million) for handling the consequences of the fire. The region's social policy ministry announced that it has already obtained funds amounting to 1.3 million rubles ($25,400). Currently, the fire victims are receiving compensation of 10,000 rubles each ($190) and up to 100,000 rubles for those whose homes have been burned down. For partial losses, compensation of up to 50,000 rubles ($940) is being paid out.